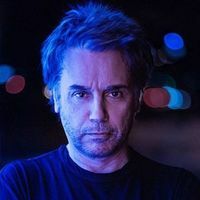 Fireworks, laser shows, huge banks of equipment, grand projections, dramatic swathes of keyboard driven opuses... Jean Michel Jarre pioneered outdoor instrumental spectaculars and has sold over 80 million records. The son of composer Maurice Jarre, he was born into a family of artists - an important influence in his later amalgamations of music and art - raised in Paris and studied classical piano before playing guitar with The Dustbins in 1967. He released his first single La Cage/Erosmachine, mixing synths with tape loops and effects, in 1969 and composed music for TV and theatre before releasing his debut album Deserted Palace in 1972. Jarre went on to write music for Francoise Hardy and finally became an international star in 1976 when he released the Oxygène concept album, a low budget but dramatic cacophony of melodies and effects. The more baroque follow-up, Équinoxe saw him performing to mass audiences as his shows became more spectacular and he was the first western artist invited to play in China. More ambitious albums such as Les Chants Magnétiques, Rendez-Vous, Zoolook, En Attendant Cousteau and Métamorphoses followed and, after a seven-year absence, Jarre returned to recording in 2007 with the trance-like dance album Teo And Tea.